Virtual New Zealand Stamps: 2013 Matariki - The Koru. When the star cluster known as Matariki appears in the night sky it signals the Maori New Year and a time of new beginnings. 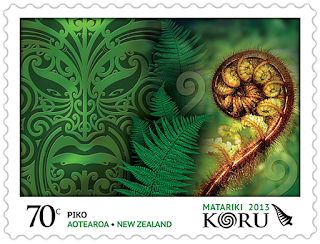 The Matariki 2013 stamp issue celebrates the koru - a pattern symbolising new life and regeneration. Matariki is a significant event for Māori and is widely acknowledged to signal a change of seasons. In traditional Māori society, Matariki was believed to foretell whether the year ahead would be plentiful. It was also a time of festivity when communities would come together to reflect on the past and look ahead to new beginnings. The message of new beginnings is represented in the koru pattern, which is derived from an unfurling silver fern frond. 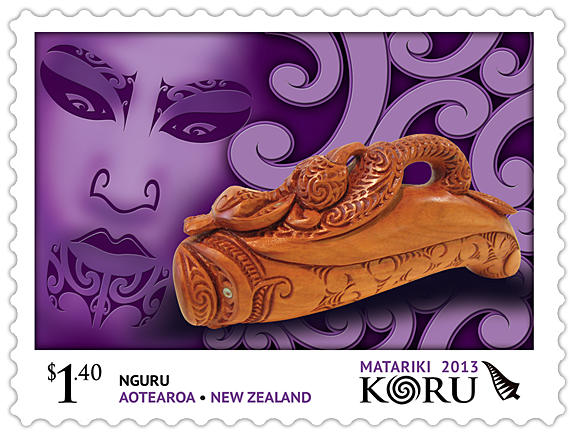 Each of the six self-adhesive stamps in this issue incorporates the koru pattern along with aspects of traditional Māori culture that have particular significance during the time of Matariki. So where does the Koru pattern come from? 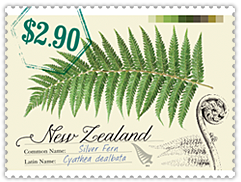 Silver Fern from 2013 Native Ferns Issue. There are many types of ferns found in New Zealand with about half of them only found here. Most of them grow from a tight ball, that unrolls as a spiral before flattening out into the full fern leaf shape. This spiral, known as the koru was recognised by the Maoris as a symbol of new life. 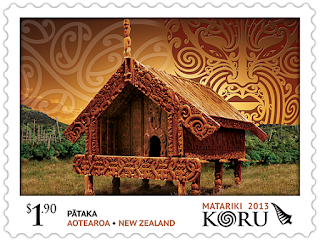 When we put this beside Matariki the beginning of a New Year we can see what a perfect match this makes for a Matariki Stamp Issue. Already 2013 had seen the Native Ferns Issue, one of which I have used as an example above, now came the Matariki issue taking the koru into the world of Maori design. 70c - Piko (Self Adhesive). The koru pattern is used in many Māori and New Zealand art forms and symbolises new life, regeneration, growth, strength and peace. For many, this form is the symbol of renewal and of hope for the future. In this stamp, the piko is blooming and will grow into a rauponga (fern leaf). The artwork surrounding the fern represents the domain of Tāne Mahuta - the God of the Forest. Notice the complex pattern of the native koru where each branch of the unfolded frond is represented in the unfolding koru. This gives the carver or painter the scope to either used the simple form of the Koru or for deeper detail by placing further smaller koru to represent each branch. 70c - Manu Tukutuku (Self Adhesive). Sometimes the koru can be used in a non-literal way to symbolise aspects of Māoridom and is often seen in carving and ta moko (tattooing). 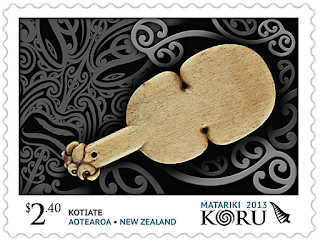 In this stamp the koru pattern symbolises the winds of Tāwhirimātea (the God of the Weather), and soaring on those winds is a kite or a messenger between Heaven and Earth. In the background, the sunrise depicts the first day of Matariki, and the sky - the domain of Tāwhirimātea. Maori kites were the theme of the 2010 Matariki Issue. As well as being a plaything for children the kite also represented the spirit of the person soaring into the air, ready to leave on their last journey into the spirit world. $1.40 - Nguru (Self Adhesive). The pattern that covers the nguru (flute) in this stamp is made from a series of koru shapes that depict the music making pleasing shapes in the silence. In the background is the face of Hine Raukatauri, the Goddess of Flute Music, who loved her nguru so much that she decided to live in it forever. 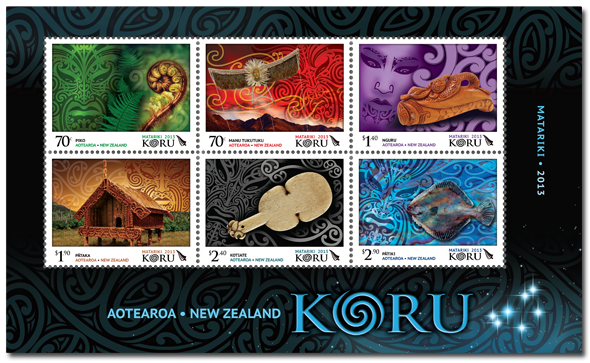 This stamp shows different ways in which the koru can be used. Look at Hine Raukatauri's face. See how the koru is used in her eyebrows and also in the moko (tattoo) under her mouth. In one the koru is a solid line while in the other two lines for the koru with a hollow darker one between. $1.90 - Pataka (Self Adhesive). 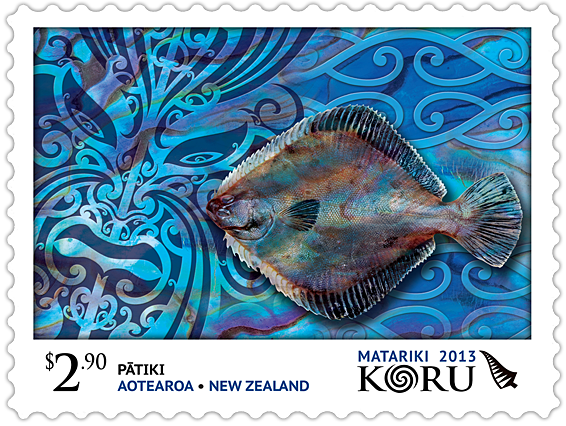 This stamp design talks about Matariki as a time of abundance, feasting and the opportunity to flourish. The pātaka, or storehouse, is covered in koru and represents the concept of planting and storing kai (food), the gathering of kai, and nourishment and wellbeing. This is the domain of Rongo-mā-Tāne, the God of Kūmara and Cultivated Food. There is a good example of a pataka in the Auckland War Memorial Museum. $2.40 - Kotiate (Self Adhesive). The mangopare design seen swirling around the kotiate (club) is a traditional Māori interpretation of a hammerhead shark, featuring symmetrical koru as the distinctive head. It symbolises strength, determination and an unwillingness to yield. It is very much the warrior symbol and speaks of the attributes that a warrior must possess. The kotiate and mangopare together represent the domain of Tūmatauenga, the God of War and Balance. $2.90 - Patiki (Self Adhesive). The pātiki (flounder) design, with its swirling koru inside the shape of the pātiki, is used in many carvings - particularly in pātaka and waka (canoes). It is the symbol of hospitality and can represent the catching of fish from the domain of Tangaroa, the God of the Ocean. The swilling of the ocean and breaking of waves can also be seen in the koru shape. 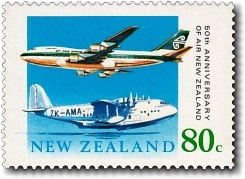 Two examples of the Air New Zealand Koru. On the left can be seen a Boeing 747 from 1990 while on the right is a Boeing B787-9 from 2015. The aircraft has changed, the colour schemes have changed but notice, the koru is the same. 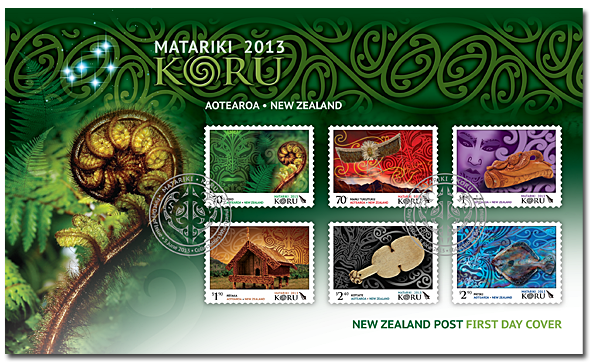 2013 Matariki Koru - First Day Cover. 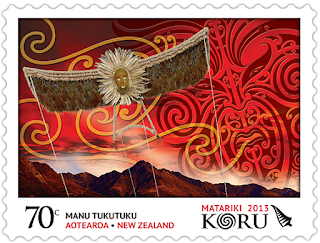 2013 Matariki Koru - Miniature Sheet. The issued stamps were self-adhesive but gummed varieties are available for the full set from the miniature sheet which of course means you will be breaking up a miniature sheet. 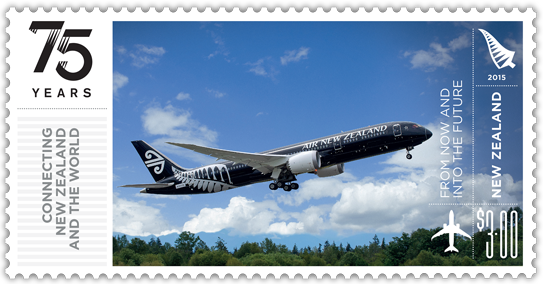 Currently, 2016, Stamps New Zealand are offering an adhesive set, a gummed set or the miniature all for the same price of $18.00 NZ. 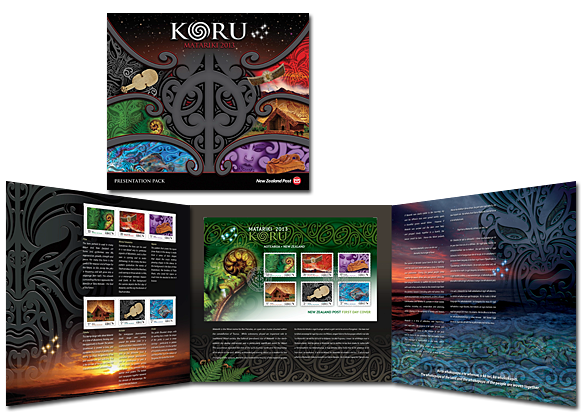 This issue also came with the 2013 Koru Presentation Pack. The upper view shows the cover of this pack with the lower view showing the open 3 page spread inside. Pride of place in the centre is a special, limited edition miniature sheet. Date of issue: 5 June 2013. The number of stamps: Six self-adhesive stamps. Denominations: 70c (x2), $1.40, $1.90, $2.40 and $2.90. Stamps designed by: Dave Burke Design, Auckland, New Zealand. Miniature sheet size: 150mm wide x 90mm high. Period of sale: These stamps remained on sale until 4 June 2014.